How gender analysis can facilitate client-oriented extension planning: a case from Ethiopia. The bulk of Ethiopia's population live in rural areas and rely to a large extent on agricultural activities for their survival. Much of Ethiopia's gross domestic product (GDP) is derived from the export of agricultural commodities, especially coffee and hides. However, present levels of agricultural production are barely enough to ensure food security in Ethiopia. Much of the farming consists of smallholder subsistence farming and this is coming under many pressures; population is increasing and as a consequence landholdings are becoming smaller and land degradation is becoming more severe. The overall aim of agricultural extension is to increase agricultural productivity and to improve the standard of living of rural dwellers. It can be assumed that the more clients extension serves, the more effective it will be in achieving its aim. Most extension workers in Ethiopia are men, and they generally work with male heads of households. It is now widely recognized that women contribute significantly to agricultural production in many countries. A survey carried out by the Planning Department of the Ministry of Agriculture in 1992 revealed that women, who constitute 40 percent of the total agricultural labour force, lack access to extension, credit and inputs. The result is that a significant proportion of the agricultural producers - women - get little advice and support yet the country relies on their contribution to food production. If food security is to be achieved, it is essential that this 40 percent of the labour force is reached by extension. In this article an innovative strategy for extension, that of using gender analysis and a participatory approach to facilitate client-oriented extension planning, is outlined with reference to a case study in Ethiopia. The methodological steps taken to draw up a client-oriented extension plan are briefly outlined, the nature of the outputs of the approach are listed, facilitating factors are analysed and the lessons learned presented. Evaluation findings and plans for continuation of the project are referred to and finally conclusions are drawn. Various extension systems have been followed in Ethiopia (Ejigu, 1996). Until recently, the training and visit (T+V) system predominated and still does in some parts of the country. The latest extension system, the Participatory Demonstration and Training Extension System (PADETES), is being implemented in most regions. PADETES involves demonstrations of the production of major staple food crops in three different ecoclimates: moisture reliable, moisture stress and drylands. 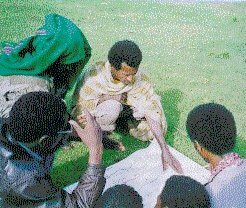 From 1994 until 1996, a two-year pilot project in client-oriented extension training was implemented by the Extension Division of the Ministry of Agriculture, facilitated by FAO and financed by the Government of the Netherlands. The project, which was coordinated from the national level, took place in three pilot zones in three different regions (the Amhara, Oromia and Southern regions). The pilot project had two objectives: improvement of the capability of the Extension Division, at national and regional levels, to design and implement client-oriented extension training, focusing on gender issues and using participatory approaches; and development and integration of a gender-sensitive analytical framework into the agricultural programmes of the Ministry of Agriculture at the central and regional levels. Client-oriented extension is based on the needs and constraints of the clients themselves, which vary within communities and even within households. Gender analysis provides a way to reveal such differences, thus paving the way for more specific and informed planning. Projects and programmes that have undergone gender analysis at the planning stage are more likely to be successful than others, since this analysis will clarify who can and cannot be involved in what and when and how they can be involved (Young, 1993; FAO, 1993; World Bank, n.d.). The tool for gender analysis, the gender analytical framework (GAF), allows for further dissagregation of data if desired, for example, men and women in a given community can be further distinguished by their wealth, age, marital status, educational experience and ethnicity. The project employed a participatory approach within the structure of the Ministry of Agriculture, using the action-reflection mode (Rogers, 1992). A participatory approach was also employed at the village level where participatory rural appraisal (PRA) tools were used to learn about the community and the activities and resources of client groups within the community. Studies in each of the pilot areas, conducted by extension staff after a short period of training, helped to define the methodology. After implementation, all staff came together to review the results and the constraints faced and discuss how to improve on the methodology. Selection of the community. Certain criteria were used to select the villages in which to carry out a study. The criteria included the community's understanding and willingness to participate, which were established through informal meetings between the local extension agent and a few men and women in the village and through a community meeting at the start of the work. 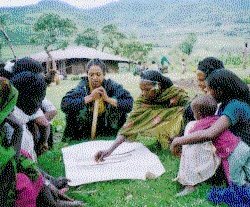 The representativeness of the community in the woreda (an administrative area - there can be between eight and 20 woredas in a zone) was considered, as was the possibility for the extension team to stay in the village during the study. The observed need for extension to be more client-oriented in that village was also important in the selection of the community. It was important that local decision-makers, such as Council members, were fully aware of the activity. how to use the tools and analysis to plan extension activities appropriate for the needs of various client groups in the communities. Training commonly took place immediately before fieldwork. Drawing up plans of action and checklists. Before starting work in the villages, the teams would draw up tentative plans of action. In the plans, sufficient time was left to analyse new information gathered at each stage and to accommodate unexpected events and delays. The teams also drew up checklists to assist them in their investigations at each stage. Usually the teams planned to spend a total of eight to ten days in the village which allowed time for meetings with community members and analysis. Less time was needed when work was done outside the farmers' busy seasons, when the teams stayed in the villages and when fewer client groups were covered (because there were fewer meetings). Gathering and analysis of information. Community meetings were held to outline and discuss the work's purpose, duration and the level of village involvement. Attendance at these initial community meetings was variable, but in most cases there was a large presence of both men and women. Next, the team gained an overview of the communities and their perceived problems through the use of several PRA tools. The team then analysed the information collected and cross-checked any contradictions. Next, in consultation with community leaders, the team identified appropriate client groups. The minimum number of client groups in any study was three: men, women and female-headed households. In some studies, there were more: the three minimum groups (above), with further subdivisions according to income, marital status (i.e. monogamous, polygamous or no marriage) or age. Ideally each client group was composed of five to six people. The team then split into subgroups. Using various PRA tools, they worked with the client groups to learn about their activities and resources. The information collected was analysed daily, prior to gathering further information. This analysis helped the teams to draw up checklists for the next day's work. Drawing up the gender analytical framework. The teams slightly modified the classic gender analytical framework (GAF) (FAO, 1992; Overholt et al., 1985) to suit the purpose of the study. The classic GAF allows for gender-sensitive project or programme planning. In this case, the purpose was to identify a way in which extension could be made more client-oriented. Later, as an outcome of the participatory action-reflection cycle, the GAF was modified again on the basis of feedback from those involved in the implementation. The framework, in both cases, consisted of four worksheets. Worksheet 1, the activity profile, indicated who did what, when and where. Reproductive, productive and community management activities were distinguished. The activity profile made it possible to see which agricultural activities women and men were responsible for and the constraints they faced. Women's gender needs (those related to their daily work such as the many hours spent fetching water and fuelwood) were clearly revealed. Worksheet 2, the agricultural calendar, indicated which agricultural activities were taking place each month and who was responsible for them. This was also useful for clarifying when men and women would be available to participate in extension activities. Worksheet 3, the resource profiles, revealed which resources the communities had and how much access in relative terms men and women had to each resource. The degree of control or decision-making power men and women had, again in relative terms, was revealed. These profiles were useful for showing the position of women in the community. The profile helped to reveal women's strategic gender needs, such as their very limited access to credit, extension and inputs as compared with men. Worksheet 4, the development constraints analysis, involved listing and analysing the development constraints in the villages in light of the activity and resource profiles, thus identifying any gender considerations. It was then possible not only to identify which extension interventions were needed but with which client group/s they should be applied. After review by the staff who had implemented the approach, this last worksheet was modified from identifying "extension interventions", to identifying "opportunities for development". The "opportunities for development" were divided into four categories: those to be addressed by: 1) the extension staff; 2) the villagers; 3) the higher levels in the Ministry of Agriculture hierarchy; and 4) the local councils in liaison with other ministries and/or donor organizations in the locality. This change was made to increase the villagers' "ownership" of the work and produce development plans that villagers could implement. This was one of the ways in which the process became more of a participatory, rather than a rapid, rural appraisal. Validation and ranking with the community. At every stage, teams verified with the communities that their information and analysis were correct. After completing the gender analysis, the teams met a final time with the client groups separately, and with the community as a whole, to validate and rank the development constraints and the possible ensuing actions that were identified. Drawing up extension programmes and calendars of work. It was important that the findings of the client-oriented approach were integrated into the existing Ministry extension planning process. As decentralization and local-level planning were fairly new to many staff, training was given to enhance planning skills and facilitate the integration of the approach at the local level. identification of opportunities for development and of who can best pursue them, e.g. the extension service, the community as a whole or a particular client group. A number of factors were recognized as having a positive impact on the project. The project took place within a favourable policy environment. First, the Government of Ethiopia was, and still is, pursuing a policy of decentralization towards more local-level planning. This project attempted to increase the capacity at the grassroots, to put policy into practice on a pilot basis. Second, as mentioned above, food security is a major concern of the Government. The client-oriented approach provides a way to make extension more accessible to more client groups, in particular to women who, although significant producers, do not generally benefit from the extension services. Third, the National Policy on Ethiopian Women, formulated in 1993, aims to create conditions that are conducive to the enhancement of equality between men and women. The policy aims to make sure that women participate in development activities, enjoying benefits on an equal basis with men. With the client-oriented approach, the status and needs of rural women become visible. The Ministry of Agriculture was open about the aims and objectives of the client-oriented project and shared and discussed them with other ministries, councils, research and donor organizations at the national level and within the pilot areas. Consequently, the expertise already developed in the pilot areas was used and built upon, and favourable relationships were established between the Ministry of Agriculture staff and staff of other organizations. The project was implemented in a participatory way. Extension staff at regional and zonal levels in each of the three pilot areas acted as project coordinators. The coordinators, as well as project staff at the national level, were involved in planning related to the timing, nature and content of training programmes for trainers and grassroots staff, as well as project implementation and evaluation. Responsibility for management and supervision of field-level activities gradually shifted from the national level to the regional and zonal levels as the coordinators took on more of these activities. Attempts were made to make the work with client groups in the field more participatory. This was done by involving the groups in the validation and ranking exercises and by switching from identifying appropriate extension interventions to identifying opportunities for development with the villages. The training of trainers approach allowed more staff to be involved as trainers and more grassroots staff to be trained. The approach incorporated the continual action-reflection cycle within, and between, training and implementation. This approach, combined with the participatory nature of both training and implementation, allowed the grassroots level to internalize the methodology. The need for flexibility. There were many demands being placed on extension staff, especially with the uptake of the new PADETES extension approach and with donor-funded activities in the Bureau of Agriculture at the regional and zonal levels. It was often necessary to reschedule project activities to fit in with these other activities. The participatory and decentralized nature of project planning accommodated this. National staff and coordinators from regional and zonal levels met several times to revise the project accordingly. The need for wider stakeholder involvement. Awareness-raising workshops were held at national and regional levels, but it was found that further workshops were needed to share the findings. This was because some of the constraints that were identified were either outside the scope of the Ministry of Agriculture or there were insufficient resources to address needs. A need to involve the development councils at all levels was realized, as these councils are responsible for coordinating the activities of different ministries and communicating development needs to relevant ministries or donor organizations. Ways in which decision-makers could be more involved were identified towards the end of the project and included: involving them right from the start; inviting them to training sessions; and involving them in decisions related to opportunities for development. Avoiding exaggerated expectations. The approach used in the client-oriented method is not dissimilar to that used by many NGOs conducting diagnostic studies in villages prior to starting projects. Inevitably, villagers would assume that having a team of ministry staff work in the village for a week or so would lead to a project or at least some material benefit for the village. The only way this expectation could be reduced was by explaining the objective of the work very clearly, both when obtaining the villagers' consent for the team to come to the village and again on the team's arrival. The need for replicability. As a result of the very specific and qualitative nature of the information collected using the client-oriented approach, it is not easy to develop recommendations from the findings that can be applied over a wider area. Yet it is certainly not possible to collect information from every village because of the low numbers of staff in relation to the number of villages. One way to address this problem is to classify an area (i.e. the woreda) according to agro-ecological and socio-economic characteristics and to select a few villages from each of the resulting categories. Findings from these selected villages may apply to others in the same category, thus making it possible to draw up appropriate extension programmes for the woreda. The project was subject to external evaluation in June 1996. The evaluation team concluded that it was effective in introducing gender awareness and promoting a client-oriented approach to extension in the pilot areas. It was noted that the case studies provided important information about the role of women in different agricultural systems and raised awareness of the importance of their activities. Following the evaluation, a proposal for a second phase of the project was drawn up. The proposal incorporated recommendations of the evaluation team and focused on rural youth and women client groups. Emphasis was placed on food security and meeting the practical and strategic gender needs of women. The second phase, if approved, will involve expansion to a fourth region as well as to new zones and woredas in existing regions. It will involve further capacity building in client-oriented participatory extension planning. The proposed second phase will also involve the drawing up of a strategy document which encompasses the client-oriented extension planning approach and a system that can be mainstreamed into the National Extension Intervention strategy. Women are significantly involved in agricultural production in many countries in sub-Saharan Africa. Many extension services do not provide enough support to women as producers, partly because their activities in this area are insufficiently recognized or acknowledged. Men's and women's gender roles are different and women have a relative lack of decision-making power within the household and community. As a result, they face different challenges and have different needs to men. Differences also exist between women with respect to other variables such as wealth and status. The use of gender analysis within a participatory local-level planning approach, makes women's involvement in agricultural production visible, as well as emphasizing the constraints that they face. Gender analysis can overcome the gender blindness that is prevalent in existing, male-dominated extension services and allow extension planning to respond to the needs and constraints of different client groups within communities. There are, however, other hurdles related to gender awareness and women's strategic gender needs that must be overcome. Gender awareness has to be raised within communities, so that male heads of households accept the need for their wives to have independent access to extension services. The extension service provided for women must be culturally acceptable and appropriate for women's busy schedules and, in some cases, relatively low levels of literacy. Initially, women may need assistance with their "reproductive" tasks (fetching water, fuelwood, etc.) as these can take up all their time. Finally, women may not voluntarily contribute more to field crop production if they have little control over the allocation of the resulting income. There are many challenges ahead if extension is to respond to the critical needs of today's changing world. It is hoped that this case study shows one practical way that extension can meet this challenge. FAO. 1990. Women in agricultural development: women, food systems and agriculture. Rome, FAO. FAO. 1992. Women in agricultural development: The FAO gender analysis training programme for professional staff. Rome, FAO. Overholt, C., Anderson, M.B., Cloud, K. & Austin, J.E. 1985. Gender roles in development projects: a case book. Conn., USA, Kumanian Press Inc.
Rogers, A. 1992. Adults learning for development. London, Cassel. The transitional Government of Ethiopia. 1993. National policy on Ethiopian women. Addis Ababa, Office of the Prime Minister. World Bank. (nd). Designing and implementing agricultural extension for women farmers. Technical Note. Women in Development Division. Population and Human Resources Department. Washington, DC, World Bank. Young, K. 1993. Planning development with women - making a world of difference. Basingstoke, UK, Macmillan Education Ltd.